Artificial flowers have improved immensely over the last few years, some of the better ones it is difficult to tell just by looking, you actually have to touch them to realize they are artificial. 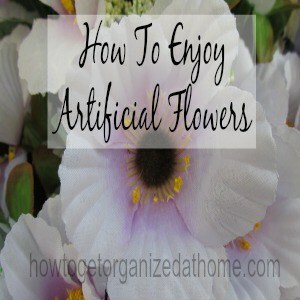 These artificial flowers allows people to have beautiful displays inside and outside their homes all year round. They take minimal care, saving you time and money compared to real flowers. Don’t restrict yourself to a few ornaments, or the odd artificial flower, see these as an investment in beautifying your home without the need to replace the flowers each week as they die. You can make a room with artificial flowers which can complete a room with the knowledge that you don’t need to spend much time for their care and upkeep to make them look good for longer. It is possible to coordinate them to fit perfectly in any room, the advantage with artificial flowers is their uniformity, it makes choosing the right colours so much easier than if you have real flowers. Remember you don’t just have to have artificial flowers on the inside of your home, it is possible to have them outside too. Hanging baskets are the most beautiful way I think you can display flowers outside; I just love them. Unfortunately, I have a poor memory for remembering to water them and they just never look as good as they could, if I was more consistent with their care including their watering. Hanging baskets with artificial flowers will save you time and money, they will look great for more than just one season and this is great news for any budget. A great way to make artificial flowers smell real is to add a touch of perfume to the leaves and petals, don’t add too much, it’s a hint of a smell rather than an over powering smell. Adding scent to artificial flowers is a great way of keeping your rooms smelling great, it doesn’t have to be the same scent in each room you can change the smell to suit the mood of the room. One great trick that I do with my artificial flowers, when I have just cleaned them I like to add a touch of scented hand lotion to the leaves; it gives a fresh smell and it helps to ensure that I have removed all the dust particles and to give the petals that extra shine. You must check that your flowers are suitable for this before you apply, because some artificial flowers get damaged by this method of adding some scent. The flowers, which you choose can add to a room décor, this season the most popular colour is white; white flowers to add that touch of the dramatic to any display. Don’t stick with the ordinary, try going for something that could shout out a more dramatic styling. White hydrangeas, bunched together in a simple glass bowl is a powerful image that I can’t get out of my head and my next artificial flower purchase I am sure will feature these. Therefore, seeing artificial flowers as a way to add a statement to a room is just the beginning of what you can use artificial flowers for, don’t forget those outdoor plants too, saving you time and money over the course of the life of the artificial flowers.